Cutting Edge Stencils offers the highest quality decorative stencils for today's DIY enthusiast. Try Wall stencils instead of wallpaper! Our reusable large wall stencils are easy to work with, and even beginners get great results. Our Tile Stencils help you to save a lot of money on tile floor or backsplash remodel. 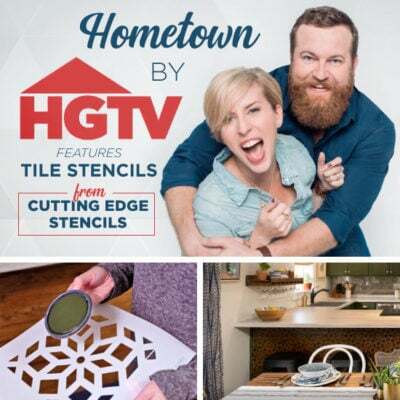 Simply stencil your old tile floor or backsplash with a tile stencil using correct products and get a brand new looking stenciled tile for a fraction of the cost of a real cement tile! Our reusable stencils are expertly designed by professional decorative artists Janna Makaeva and Greg Swisher with over 25 years of stenciling, painting and decorating experience. We love to share our passion for DIY decorating and hope to inspire you to beautify your home with our easy-to-use stencils! We offer extensive customer support - Best in the industry! - because we want your stenciling project to be a complete success. Stencil is a great money-saving tool for a modern DIY-er. 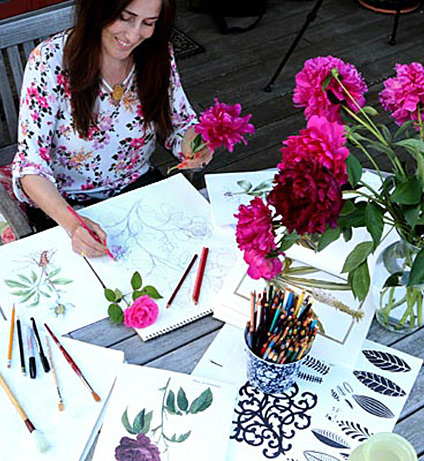 Our trendy stencil patterns include Tile Stencils, Moroccan stencils, Craft and Furniture stencils, Damask stencils, nature-inspired Tree Stencils and Flower stencil designs. All of our stencils are proudly made in USA to highest standards. Just WOW! This tropical theme is still a trend all over Pinterest! We want your stenciling project to be a total success and we are here to assist you and answer all of your stenciling questions. We stand behind our product, returns are easy and there is no restocking fee. All of our stencils are proudly made in USA. We precision-cut our stencils on lasers from 10 mil mylar. Or stencils are reusable, easily washable and very intuitive to use even for beginners. We personally inspect each stencil to make sure it's defect-free and ready to use. We include detailed illustrated stenciling instructions and TWO small complimentary stencils with every order. Creating beautiful rooms with stencils is a rewarding experience. While it takes an artist to design a good stencil, Stenciling itself is a simple technique that does not require an artistic ability. In fact, pretty much anyone can stencil, as long as you can hold a roller or a brush! We're happy to teach you how to stencil. Please take a look at our illustrated Stenciling instructions to learn how to stencil step-by-step. You can also quickly learn stenciling by watching our expert How to Stencil Videos. We are confident that once you try this amazing decorative technique, you'll fall in love with it! Our stencil designs are perfect for DIY accent walls. 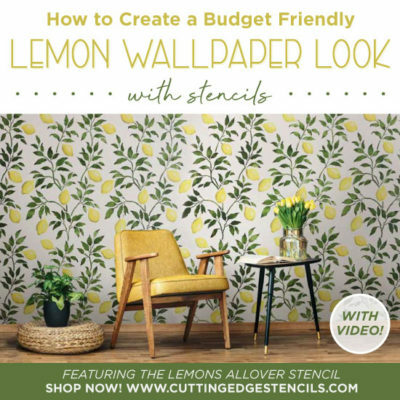 It's amazing how much money you can save by using stencils instead of designer wallpaper! Wallpaper is quite expensive, and also a hassle to install and later remove. 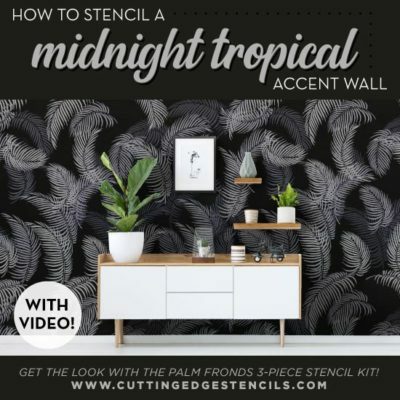 With wallpaper stencils, you can stencil entire room with just one stencil, and when you're ready to re-decorate, removal is as easy as 1-2 coats of fresh paint. Many of our accent wall stencils are large stencils! Any decorating pro will tell you how important the size of your stencil is. Stenciling a large room with a small wall pattern stencil can become tedious and frustrating. With our large wall stencils the job gets done so much faster and final result is so beautiful and satisfying! We even include free top edge stencils with our large stencil patterns so you can easily finish the top edges of your walls. Even though we offer large stencils, our prices are quite reasonable. Stencils offer so many creative opportunities: they work great not just for accent walls, but for floors, ceilings, fabric and furniture. You can up-cycle a dated garage-sale furniture into a stunning modern piece using our Furniture stencils. And a pair of inexpensive plain curtains can be quickly transformed into beautiful chic patterned fabric with stencils and fabric paint. Our popular Tile Stencils help you to save a lot of money on tile floor remodel. 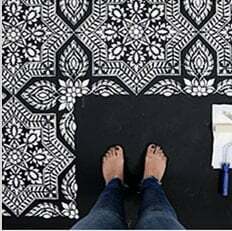 Simply stencil your old tile floor with a Tile stencil using correct products and get a brand new stenciled faux tile floor for a fraction of the cost of a real cement tile! Or, try creating a sophisticated wall mural with our beautiful mural stencil kits. Walls, floors, ceiling, tiles, lamp shades, trays, accent pillows, rugs, outdoor patios and decks, and even hand-made paper cards - all of these DIY projects are fun and stencil-worthy! All of our stencils are designed and manufactured in USA to highest industry standards. We design and cut all of our stencils in-house. This eliminates any middlemen and allows us to offer the highest quality stencils at the lowest possible prices. Cutting Edge Stencils team consists of friendly and dedicated professionals who love working together in a positive, supportive, low stress environment that we cultivate as a company. We are known for our great customer service and have been repeatedly told it's the best in the industry! Our stenciling blog, Stencil Stories, is a wealth of information for the beginner and advanced stenciler. Lots of How To Stencil tutorials, step-by-step DIY Home Decor ideas, stenciling tips and tricks, wall paint ideas and amazing before and after transformations. Fresh Room ideas posted daily! Visit our Stencil Ideas Gallery to see beautiful examples of stencil decor done by us and by our customers, many of whom had never tried stenciling before! We have lots of stencil ideas to inspire your creativity. Don't be a stranger and follow @CuttingEdgeStencils on social media - we have a huge social following and post new inspiring photos of creative stenciled projects daily. Our professional decorative company, Specfin Designs, has been a leader in faux finishes and decorative painting for over 20 years in NYC/NJ Metropolitan area. We have hundreds of original hand drawn stencil designs that we have turned into well-engineered sturdy stencils that are easy and fun to use. For over 20 years we painted, faux finished, plastered and stenciled in hundreds of upscale homes in the New York metropolitan area as well as other states around the country. So when we say "We know decorative painting and stenciling" we really mean it! :) We want you to be successful in your DIY stenciling project, and we stand behind out product. You are welcome to browse our extensive portfolio to see exiting stencil decor ideas for your home. We are proud to have 100% positive feedback from our customers, both pros and first time DIY decorators. Your satisfaction is our top priority, and we would love it if you share your finished stenciling project pictures and comments with us. Sign up for the Cutting Edge Stencils newsletter! The discount code will be sent to you immediately!